Dr. Heimlich's first claim to medical fame was a surgical technique that involved replacing a patient's damaged esophagus with a gastric tube. In 1955 Heimlich had published a paper in the journal Surgery describing how he had performed the operation on dogs. A Romanian physician, Dr. Dan Gavriliu, wrote to Surgery to point out that he'd been performing the same operation successfully on humans for four years. 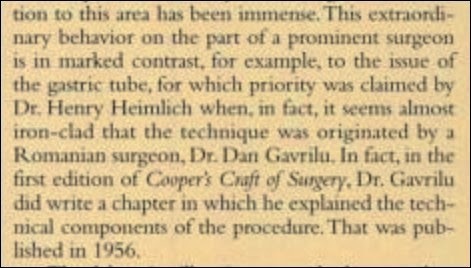 Karen discovered a 1957 article in Surgery written by Heimlich in which he conceded that Gavriliu was indeed first to perform the operation on humans. It might have been chalked up to coincidence - two inventors arriving at an idea within a few years of each other - except that Heimlich still takes credit for the "Heimlich Operation" on his website. ...Peter leaked the story to the Cincinnati Enquirer, whose front page expose in March 2003 quoted Gavriliu as calling Heimlich a "thief." 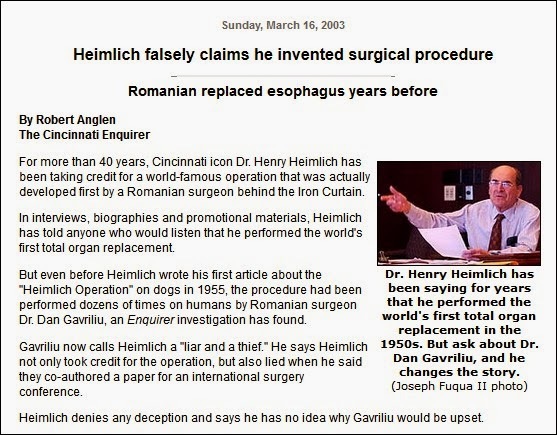 In the article Heimlich admitted again that Gavriliu had been the first to perform the procedure and insisted he had given Gavriliu credit, which he had, though selectively and in most cases well out of the public eye. (Heimlich) for years has taken full credit for the operation. "I conceived of an operation to replace the esophagus. After successfully performing the procedure on a series of patients, I presented the results at an American Medical Association meeting." "My specialty resulted from developing the reversed gastric tube operation for esophageal replacement. Previous attempts at replacing the esophagus out of the upper stomach and intestine were not very successful." "I have never been satisfied with existing methods and seek to simplify and improve them. After devising an operation for replacement of the esophagus, I became aware that with one such discovery I could help more people in a few weeks than in my entire lifetime as a surgeon in the operating room." "Let Heimlich be a pig if he wants to steal an operation and put his name on it," says retired New York surgeon Eugene Albu. "He changed the name from the Gavriliu Operation to the Gavriliu-Heimlich Operation. Then it became the Heimlich Operation later on." After the Enquirer gave my father his long-overdue comeuppance, who'd be daft enough to try to defend him? My brother may be ready and willing (if not particularly able) to deliver such baloney, but the facts have been settled in the reality-based community, right? Nevertheless -- per an item I blogged a couple weeks ago, How did (the) long-debunked "Heimlich Operation" lie get into Publishers Weekly review of my father's autobiography? -- the truth is still pulling its boots on. Both updates still provide my father with a measure of (undeserved) credit, but they're short reviews and readers who see Dr. Dan Gavriliu's name can Google their way to learning more. 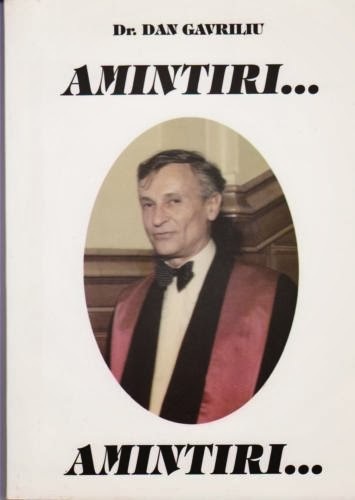 And if you're fluent in Romanian, you can read the chapter from Dan's 2004 autobiography, Memories...Memories... (which he sent me at the time) in which he discusses my father's conduct and how Robert Anglen's Enquirer article came to be published. There have also been a couple of strong articles in the Romanian press by veteran reporter Miruna Munteanu of Bucharest. Acclaimed professor Dan Gavriliu the first surgeon in the world who succeeded in 1951, complete replacement of an organ inventing reverse gastric tube procedure, lives today at age 93 with a pension of 749 lei per month. ...Professor Dan Gavriliu receives the monthly equivalent of about 250 dollars. And a not unimportant detail, Dr. Henry Heimlich is a multimillionaire. In Part II, I'll be addressing problems with my father's version in his memoir that's due to be published by Prometheus Books on February 11.